While the rest of the world is working to become more innovative and competitive, the North Carolina General Assembly is considering a bill that will stifle innovation, hurt job creation and slow economic development. 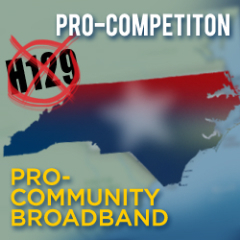 The Bill, H129/S87 will effectively prevent any community from building a broadband network and impose onerous restrictions on existing networks, including Wilson’s Greenlight and Salisbury’s Fibrant. Greenlight and Fibrant are the most technologically advanced citywide networks in the state, comparative to the best available in the U.S. and international peers, according to a study released by the Institute for Local Self-Reliance (ILSR) in November, 2010. This bill will protect the aging networks of incumbent cable companies—furthering their effective monopolies—that have refused to invest in newer, faster technologies. “This bill is a job and competitiveness killer. I don’t know why North Carolina wants to protect old technology, but if they want to get on the information super highway in a horse and buggy—the world is going to pass them by,” said Christopher Mitchell, Director of ILSR’s Telecommunications as Commons Initiative. You can now Sign a petition showing your support for community networks in North Carolina - please make sure this link circulates among any contacts you have in NC!